Wilson Menashi palmed a squid in his left hand and extended his arm into an aquarium tank, watching as a giant Pacific octopus stretched out arms to greet him like a friend. Freya latched some of her 2,240 suction cups onto Menashi's arm, using their powers of taste and smell to gather information around the 84-year-old man known as the octopus whisperer — and the seafood treats he was bearing. "She's just contacting me and she's saying, 'You come to me,'" Menashi said of Freya, a 3-year-old predator weighing 35 to 40 pounds (18 kilograms). Her arms span 14 feet (4 meters) and pack enough strength to kill sharks and other enemies. But this afternoon's gentle interaction left no doubt that Menashi has a special way with the cephalopod, whose body includes a large, sac-like head and eight powerful arms. More than 25 years ago, Menashi retired after a career as a chemical engineer and began volunteering at the New England Aquarium in Boston. He's spent 7,800 hours — the equivalent of about four years working full time — hanging out with octopuses, the aquarium said. "I've been able to interact with them from the beginning. I do not know why. I cannot explain it, but I can connect with them," Menashi said, standing in front of the Olympic Coast Sanctuary exhibit that is home to Freya and Professor Ludwig Von Drake, a younger male giant Pacific octopus living in a separate tank. Menashi's eyes twinkled with mischief as he acknowledged that encounters with octopus have left a mark on him. "I will come back home sometimes with hickeys all over my arm and my neck," he said. So how did he explain them to his wife? "Not too difficult when you have about 10 or 15 marks next to each other," he said. "It did not take too much. She also knew where I was, anyway." Menashi's volunteer work has included designing puzzle boxes for octopus as well as rubbing their backs and wrestling their arms, all intended to ensure that the highly intelligent animals receive the mental stimulation to thrive and stay healthy. Two decades of working with the largest members of the octopus species has not dulled his sense of wonder at the animal's adaptability and mysteries. Experiments have shown these animals to be color blind, but they are supreme masters of camouflage. A complex system of pigment cells, nerves and muscles allows them to change skin color in the blink of an eye to match their surroundings. "What I find totally surprising is how they could tell different people and react differently," Menashi said. "I've also made them a few toys, made up some boxes and ... I put different latches so they could get in and figure out how to get the food that I put in the boxes. However, I've had some that said, 'It's too much time to figure out how you do the latch.' So they just crushed the box." That eye for detail, patience and willingness to experiment makes Menashi a perfect octopus whisperer, said Bill Murphy, a senior aquarist. "Every octopus is different. So then you can't use the same rules for every octopus," Murphy said. "You need to change it up. And Wilson does that." 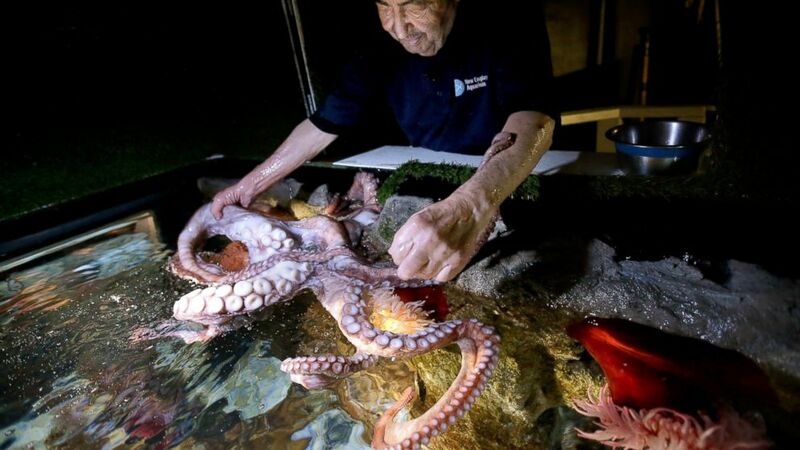 Menashi said spending time with octopuses and other animals gives his life a whole new purpose in retirement. "Just being here has been, to me, a lifesaver," he said. "Gave me something to do. Gave me different interests and showed me the world is a wonderful place to be." Follow AP video journalist Rodrique Ngowi on Twitter at https://twitter.com/ngowi . This story has been corrected to say that an octopus has arms, not tentacles. With BC-US--Octopus-Things to Know.